1. 6 oranges, Peeled, diced. 2. 5 pounds cabbage, shredded. 3. 5-ounce raisins, soaked in warm water drained. 4. 6 pineapple slices, diced. 5. 1 cup thick French dressing. 6. 1/4 cup orange juice. 7. 1/4 cup pineapple juice. 8. heads iceberg lettuce shredded. 10. 1/2 cup chopped parsley. 1. In a mixing container combine the oranges, cabbage, raisins,and pineapple toss gently and chill. 2. Blend the pineapple and orange juice into the french dressing. 3. 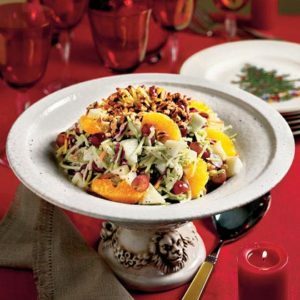 Pour the dressing over the fruit-cabbage mixture and toss gently just before serving. 4. Serve on a base of leaf and shredded head lettuce. Garnish with chopped parsley. 1. 4 pounds cabbage shredded. 2. 1-pint pineapple, canned drained medium diced. 3. 1-pint eating apple medium dice. 4. 1 tablespoon onion minced. 5. 1 tablespoon parsley chopped. 6. 1/4 cup salad oil. 7. 2 tablespoon lemon juice. 8. 1 cup sour cream. 9. 1 cup mayonnaise and salt to taste. 1. In a mixing container combine the cabbage, pineapple, apples and onion, toss gently. 2. Blend together the mayonnaise, sour cream, salad oil and lemon juice. Pour the dressing over the fruit vegetable mixture and toss gently. 3. Season with salt and serve on a leaf of lettuce garnished with chopped parsley.